Our Poly MVA Support Group consists of cancer survivors who have bravely fought against various forms of Cancer and other Degenerative diseases. Many of our members are Stage 4 Cancer Survivors that were diagnosed with various typles of metastatic cancer, like breast, colon, lung and prostate, who had been given little hope of survival by existing conventional treatments. Other members have a high incidence of Cancer in their families and are using Poly MVA(Lipoic Acid Mineral Complex or LAMC) as an Alternative Cancer Treatment in order to mitigate disease & aging. 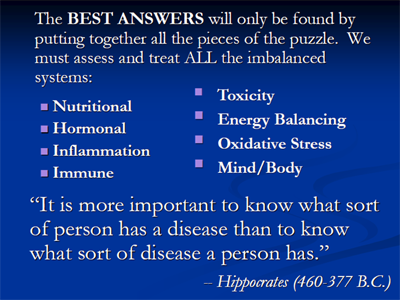 associated with Cancer & other Degenerative conditions. low oxygen(hypoxic) conditions at the cellular level. 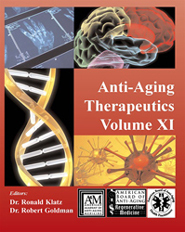 As noted in the Video below, as well as Dr. Forsythe's "70 month - 1,000 Patient Stage IV study" (see graphic at bottom of page), Poly-MVA has been documented to provide statistically significant benefits as a stand alone cancer option in 3 separate "Stage 4" Outcome Based Studies(survival vs non-survival) performed by Dr. Forsythe. However, even better statistical results have been achieved by Dr. Forsythe when Poly-MVA was used in combination with integrative therapies and low dose Chemotherapy. 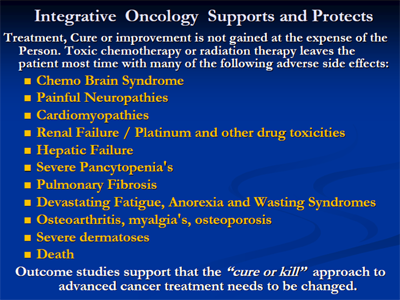 This means an Integrative Cancer Therapy like Poly-MVA is not an "either or option". Meaning, Poly-MVA does not interfere or compete with Chemotherapy. As a result, many patients and some of our Survivors chose to take Poly-MVA as an "adjunct" in an attempt to support and heal their bodies thereby making their chemotherapy/radiation regime more effective. Many of our cancer patient testimonials verify how Poly MVA significantly reduced the toxic sides effects associated with Conventional Cancer treatments. However, some of our Stage IV survivors refused chemo/radiation altogether or had become "Chemo resistant" and used Poly-MVA as an Alternative Cancer Treatment to heal their bodies after their Conventional treatments had failed. 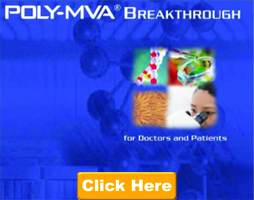 As noted in the myriad of testimonials found on this site, many of our members detail the protective effects Poly-MVA provided them as they underwent chemo and radiation treatment. In many cases, the patients report increased energy levels, improved appetite and the prevention or significant reduction of hair loss compared to other patients who did not add Poly-MVA to their treatment protocol. 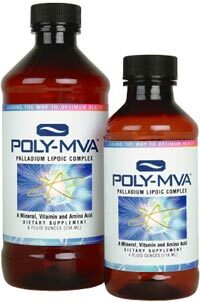 Poly MVA is a safe and powerful formulated redox molecule that protects both cellular DNA & RNA. Poly MVA's scientifically designed mechanism of action is to help the cell “fix itself” while assisting the body to control and “fight the cancer” rather than randomly "poisoning the system" via chemo and radiation that causes systemic cellular collateral damage. This method of cancer treatment has clearly demonstrated safe, antitumoral activity (Independent Lab Tests). Compared to chemotherapy or when taken in combination with chemotherapy, Poly MVA offers an extremely powerful Integrative Cancer Treatment by minimizing the toxic side effects associated with most Conventional Cancer Treatments. Dr. Merrill Garnett has done substantial research and scientific work in biochemistry and electrochemistry over a period of 40 years. As the lead research scientist at the Garnett McKeen Laboratory, in Stony Brook, New York, Dr. Garnett is the inventor and recipient of multiple U.S. patents for the PolyMVA complex. "We have seen patients go into full remission with aggressive, stage IV cancers and we see continued positive responses in others with previously chemo-resistant cancer. " 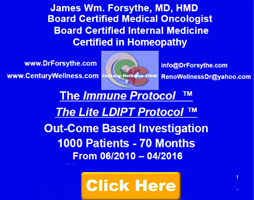 Board Certified Oncologist - James W. Forsythe, M.D., H.M.D. For nearly 40 years, Dr. Garnett has probed the secrets of molecular biology and the mysteries of cells, following his revolutionary dream for a safe and effective treatment for cancer. He saw cancer as the failure of cells to replicate/repair/regenerate normally in a default mode; instead, cloning itself within the cancer mechanism over and over again. He realized that this failure to mature was a problem of energetics in the cell’s metabolic processes. Dr. Garnett began the lonely search to find a molecular compound that would restore healthy pathways for growth and normal development within the cell—pathways missing in the cancer cells. He searched for a metallo-organic compound that would act as a molecular shunt/redox molecule to restore the cell’s healthy/normal energetics. In 1995, Dr. Garnett patented this formulated agent which selectively targets and destroys anaerobic malignant cells as well as various anaerobic protozoa, yeasts and bacteria. This complex was named POLYDOX (U.S. trials) and its dietary supplement version Poly-MVA (Canada and Mexico) or LAMC by some researchers. The MVA stands for minerals, vitamins, and amino acids, and LAMC is Lipoic Acid/Mineral Complex. When lipoic acid, a powerful antioxidant with many biological functions, is connected to an electrically charged mineral substrate, and joined with various B vitamins, the resulting complex becomes totally soluble in both water and fat. It can easily and safely travel throughout the body and into every cell, crossing the blood-brain barrier as well. Therefore, performing that journey across the blood-brain barrier (which is not possible for most drugs, including chemotherapy) makes Poly MVA excellent in cases where no other remedies are possible.